UPDATE: Here’s our story on the opening. The tribe recently entered into a compact with the state creating guidelines for regulating legalized marijuana on tribal land. 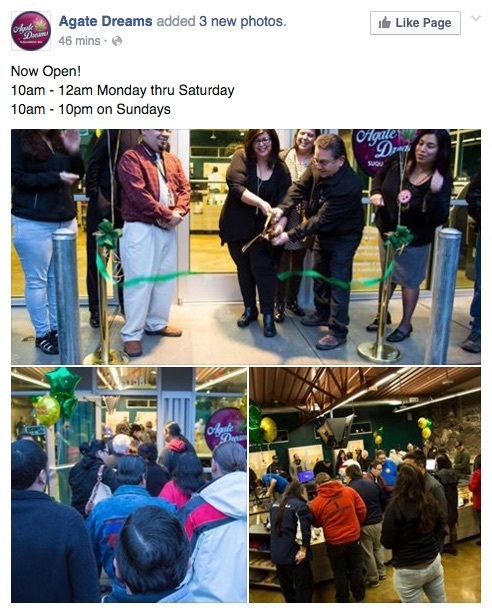 The Squaxin Island Tribe in Shelton signed a similar compact and opened a marijuana store in November. The Suquamish store is located at 15915 Highway 305, next to the Texaco station. The enterprise is being operated as a subsidiary of Port Madison Enterprises, the tribe’s business arm. After news broke the Suquamish Tribe would be entering the recreational marijuana market this fall, I was interested in gauging the reaction of the nearest state-licensed marijuana retailer. 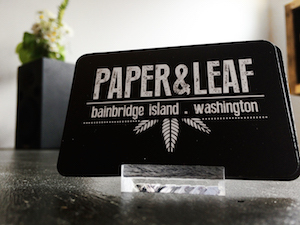 That retailer is Paper & Leaf, a marijuana store that opened on Bainbridge Island in June. The Suquamish marijuana shop will be located about three miles north of Paper & Leaf on Highway 305. Personally, we are excited to see interest in the legalized retail recreational marijuana landscape expanding. As one of the fastest growing new industries in Washington, we feel grateful to be invested in a business model that can welcome others with open arms. When my partner, Steve Kessler, and I made the decision to open Paper & Leaf, it was because we had a unique vision for the store. We wanted to create a welcoming, artistic atmosphere that reflected both of our personalities and individual interests—as well as that of the community of Bainbridge Island—which we are fortunate enough to call home. Judging by public response and consumer feedback, we’ve been successful in meeting this goal, and we feel confident in the unparalleled experience we are able to offer our customers. With that being said, we have no concerns on the pending opening of any retail cannabis shop, as each new store is further testament to the increase in market demand and the public’s evolving opinion of cannabis in the main stream. As more shops open, consumers not only benefit, but also the farmers and ecosystem of cannabis as a whole. We wish all those entering the market the best of luck in their new business venture. Wrapping up my look at the biggest real estate transactions of 2014, here is a list of the 10 highest priced home sales on the Kitsap Peninsula. 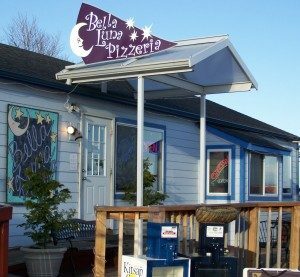 (I listed the top 10 on Bainbridge Island last week and rounded up the year’s major commercial sales). The list for the peninsula was dominated by sales in North Kitsap, with one Central Kitsap property slipping in at No. 6. You can see a ranking of Kitsap median home prices by area at the bottom of this post. These were the most expensive homes sold in Kitsap County in 2014, excluding Bainbridge Island. Details from public records and online listings. Description: 10 acres of woods and fields; 4,320-square-foot, five-bedroom house built in 2006. Listing here. Description: Under an acre of “no-bank” waterfront; 4,000-square-foot, three-bedroom house built in 1979. Listing here. Description: 3.5-acre property facing; 3,520-square-foot, three-bedroom house built in 1970. Listing here. Work has begun on a new processing plant that will allow the Suquamish Tribe to expand and diversify its seafood business. The 16,000-square-foot plant is under construction off Sandy Hook Road in North Kitsap. Suquamish Seafoods’ current facility is just 2,000 square feet. The new plant will include chilled processing areas, live tanks, cold storage and air blast freezers. Suquamish Seafoods has largely focused on geoduck sales since it was chartered in 1996. The new plant will help it branch out. 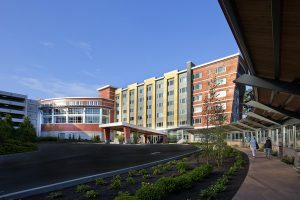 Bainbridge Island’s PHC Construction is the contractor for the $2 million project, with the tribe’s Port Madison Enterprises providing site work. You can see an artist’s rendering of the new plant here. 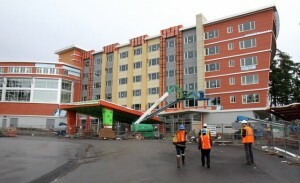 I’ll be touring the construction site later this week, so stay tuned for a larger story on the expansion project.